Though he misses the dusty roads and warm summers of his hometown of Robersonville, NC, life decisions have opened Marcus Crandell up to the possibility that Calgary, Alberta, Canada might now really be his home. Since the former star East Carolina quarterback began his professional football journey began in 1997, he had never quite felt at home. Perhaps it was winning a starting job with a team or maybe it was the authoritative announcement of his abilities that comes with being the Most Valuable Player of the Grey Cup Championship... or maybe, maybe it was settling down, marrying and buying a home that has convinced the quarterback that home is where you are, if you’ll let it be. Now, as he approaches his first marriage anniversary, life is little more grounded. To understand the sentiment, it might be useful to understand Crandell’s life in Robersonville. Growing up in very small eastern North Carolina town creates a security blanket of sorts. The community was very close. When his mother passed away, Crandell was just five years old. His father moved to Charlotte, but Crandell stayed in Robersonville with his sisters, Lecretia and Carolyn, who looked after him as he developed academically, athletically, and spiritually. Though Crandell insists that his wife, Mona, was the first to check him out, he won’t deny that he fell hook, line, and sinker when he met her by way of a “set up” of sorts back when he was with the Edmonton Eskimos. Whatever the true story, the two clicked and last September they tied the knot. Then came the house, though Crandell notes that there are no children yet. “Family life is suiting me well,” he said. “It’s one of those things in life where you are no longer thinking about just yourself. You have two people to think about, and you are always keeping your other half in mind when it comes to important decisions about life. To hear him talk, it’s hard to believe that his journey to being the starter in the pivot for the Calgary Stampeders actually took him through four professional leagues, three countries, and a lot of high hopes, dashed dreams, and reclaimed glory. In short, it was a wild ride. 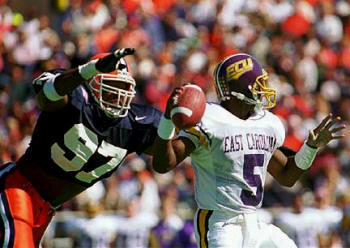 Crandell was a winner in the true sense of the word at East Carolina, where he piled up 7,198 yards passing with 58 touchdowns to go with 443 yards rushing and seven touchdowns on the ground. Along the way, he was nominated for the Johnny Unitas Golden Arm Award in 1996. In that same season, he was tabbed by Football News as one of the top-five “Players Worth the Price of Admission.” Crandell was also named First Team All-Independent Quarterback and led the Pirates to two bowl games, including a 19-13 victory over Stanford in the 1995 Liberty Bowl. His resume was sparkling and in the lead up to the 1997 NFL Draft, it appeared Crandell would have plenty of opportunities to make his name in The League. Crandell headed for Canada, hoping to get on with a club, prove himself, and use that corridor to the NFL. Edmonton was the first team to sign him, in May of ’97. For his first two seasons with the Eskimos, Crandell got sparse time, usually in mop up. Then came 1999, Crandell got his first opportunity and he did not disappoint. He played in 13 games, finishing with 767 yards passing and 75 yards rushing. 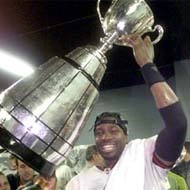 He helped take the Eskimos to the West Semi-Finals. Despite limited action in Edmonton, it appeared Crandell was on path to the NFL. 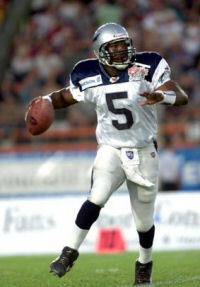 In 2000, he signed with the Scottish Claymores of NFL Europe league, where he split time with former Tennessee quarterback Kevin Daft. In Europe, he completed more than 50% of his passes for 754 yards and five touchdown passes. Scotland and NFL Europe opened the door to the NFL for Crandell, albeit a short stint. He signed with Kansas City but was released before training camp and then went to Green Bay for training camp, but was again released. Out of work, Crandell saw opportunity in the novel new Extreme Football League (XFL), started by East Carolina alum Vince McMahon. He was selected as the first pick for the Memphis Maniax and was the team’s starter. Though the game was fun, Crandell knew right away it wasn’t for him. Though the XFL was not enough to bring Crandell back for another NFL run, it was enough to give him enough clout to go full circle… back to the CFL. A week prior to the start of training camp for the Calgary Stampeders, Crandell signed with the club as a free agent. Crandell had finally found a home and it wouldn’t take long for him to make an impact. Coming out of camp as the number two quarterback, Crandell saw his status elevated just one game into the season when starter Ben Sankey went down with an injury. Crandell held on to the starting role until he, himself, was sidelined with a shoulder injury – compliments of his former CFL team, the Eskimos – in the 10th game of the season. After a five week recovery, Crandell was back in the starting lineup for a week 15 matchup with Saskatchewan. He had finally established himself as the number one guy in a professional football league. “I had just come from playing in the XFL and I didn’t know if I wanted to wait around for an NFL team to call me,” Crandell said of the weeks between the short-lived stint with the Maniax and his move back to the CFL. 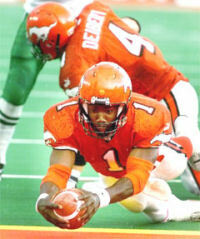 “At the time, Dave Dickerson (Calgary’s 2000 starter) had just left and signed with the San Diego Chargers. I saw an opportunity to compete for a number one job and that, really, was the deciding factor for me. After returning to the lineup in week 15, Crandell faced a daunting task if his team was to make the playoffs. Behind Crandell’s leadership, the Stampeders rallied to win their way into the playoffs and more — much more. The unknown quarterback for Calgary turned the CFL upside down with a blistering run to a CFL Championship and Most Valuable Player recognition. En route to the 27-19 upset win over heavily favored Winnipeg in the grand finale, Crandell lit up his opponents to the tune of 867 yards and 9 touchdown passes, connecting on 58-of-92 attempts. Overnight, Crandell became one of the most recognizable celebrities in the City of Calgary and perhaps in the whole of Canada. And he enjoyed the trappings that came along with the new status of champion. Still, to Crandell, it was not the NFL. So, with a Grey Cup title in hand, Crandell hoped to parlay it into another shot in the NFL. With sky-high expectations riding on the hot, new star, 2002 was a disappointment for Crandell as his team dropped down the standings and he was not able to lead them back to the playoffs. Though he played very well at times, just as he was the hero in 2001, he quickly saw the other side of the starting quarterback conundrum. Where the 2002 season was a disappointment, the 2003 season was more frustrating then anything. Each time Crandell would get hot, he would get hurt. First, early on, he missed six games nursing a hamstring injury. Then, when he finally got rolling again, he tore his MCL in a game and was finished for the season. His CFL career to date, for sure, has been an experience that touches on all aspects of the game of football and he has, indeed, learned a great deal. He is not yet satisfied, but he is getting there. At the time of this interview, Crandell and his Stampeders were struggling in the early stages of the CFL's 2004 season, looking to get things going. He has become a student of the Canadian game as well. And he is finally enjoying a little stability in his career. Fortunately for Crandell, the CFL game is suited well for his game, where passing is a premium and the ability for a quarterback to understand sophisticated passing schemes is a must. Today, Crandell finds himself at a sort of crossroads as he is getting long in the tooth by football standards. He is a aging 30-year-old. He is comfortable in his Calgary surroundings, with a family on the horizon and the knowledge that he is a more than competent quarterback. But, he may have to make a decision soon about his career. Crandell has put down roots in Calgary and it might not be so easy for him to leave should an NFL team call. He spends his off-season as an ambassador of football, so to speak, coordinating and coaching a traveling football camp called Next Level Sports. Kids have come to depend on their hero year-in and year-out to be there for them. And, he still follows his Pirates. He is very hooked into the program and is still very close with some of his former teammates and some of his comrades north of the border. 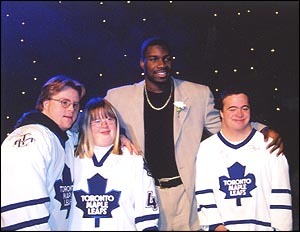 Crandell has also become good friends with Keith Stokes (Winnipeg). He has remained close to teammates Larry Shannon, E.J. Gunthrope, and Mitchell Galloway. And, as expected, he has remained close to his former coach and mentor Steve Logan. Despite the changes in the program since he left, Crandell feels good about his Pirates. And, Crandell also believes that he has the right situation now…after too many seasons of uncertainty.